LynchyRightNow: The 1998 Houston Rockets ? ? ? My worst fear in the world is that the 07'-08' Boston Celtics suffer the same fate as the 98'-99' Houston R ockets, or that I pull an Oscar De La Hoya like fate and end up in a Las Vegas hotel room dressed up in fishnets with five to seven exotic strippers . . . .which could happen, but I digress. If you recall, the city once known as Clutch City, decided to comprise a team which could knock off the Western Conference and put them back to the top of the mountain. They drafted everyones favorite March Madness star, Bryce Drew (see kids who played for their father in college.com) Arizona Stud, Michael Dickerson, and URI standout not named Lamar Odom, Cuttino Mobley in the second round. But to surround Sir Charles & Hakeem Olajuwon, they also signed 50 greatest player, Scottie Pippen, who had clearly begun the down slope of his career, but was still more than serviceable. Pippen, Sir Charles, and The Dream . . . .three of the games top superstars all on the same floor, they couldn't lose right? Well, they finished that year six games out of first place, in the 3rd slot, then subsequently got smashed like me on a friday night, in the first round 3 games to 1 by the Lakers . . . Title Run, OVER. With that said . . . So I've calmed down two months later, I've laughed at Portland fans, because in the immortal words of John Malkovich in Rounders "all your dreams, down zee fackin drain." Then I stopped laughing, because if Garnett gets injured, or Paul Pierce gets stabbed again I'm going to go on a ten state killing spree (sorry this is the year 2007 I can't joke about that) then I laughed at the Lakers still trying to trade Lamar Odom (second Odom refernce) to anyone for a bag of balls. Side Note: do you think GM's just laugh when the Lakers show up on their speed dial? What are you going to trade? FOR REAL? But that was us till we remembered Kevin McHale would trade anything, he just likes being in a trade, I feel about Kevin McHale the same way I feel about T.O. outside of playing the actual sport, I don't want to hear from him. By all accounts though, in complete seriousness, this team should whipe the floor with the Eastern Conference this year . . . . Then the finals, and anything can happen, my bet is for Steve Nash to break an ankle, Tim Duncan to be suspended for steroid use, and Tim Donaghy to be reffing the finals (while i'm paying him off) . 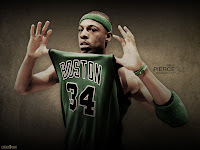 . . GO CELTS!